"A lot of people hate this hat. It angers a lot of people, just the sight of it." Yes, he was talking about this hat. The garish, in-your-face, take-no-prisoners hat that we're offering you today. It's bold, it's beautiful, and it's made from fantastic materials. 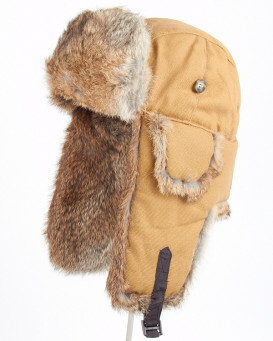 Real rabbit fur, brightly-colored outer shells made of canvas or waxed cotton, and sturdy fasteners and straps all combine to give you a seriously quality piece of headgear that will evoke a reaction from those around you. The Mad Bomber® company has a tradition of being responsible for what they produce. So you know that you're getting a product that, while it's made in China, hasn't been created by legions of underpaid workers dealing with terrible conditions. In fact, the company's facilities are staffed by self-employed Chinese entrepreneurs, something really rare in the manufacturing industry in China. You can feel good about buying a product that is globally responsible when you buy a Mad Bomber®. 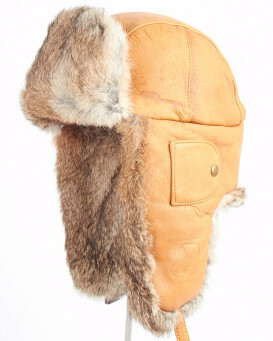 You can wear it with the ear flaps strapped up during those delightfully cooler periods of the spring and fall, or cinch the strap tight across your chin in the deep cold months of winter. 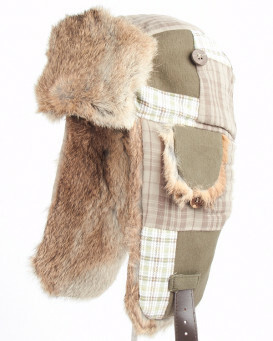 However you need to wear it on any given day, this is definitely a hat that really adapts to your needs. We offer this hat in seven playful colors, which makes it surprisingly easy to find one that suits your own crazy sense of style. From real tree patterned hats to vibrant plaid to some beautiful solid colors, you can be sure you'll find something to really match your sensibilities. "Arrived quickly, fits perfectly, looks great. No complaints whatsoever."